For decades, the industrialized world enjoyed the luxury of producing far more milk, butter and wheat than its citizens could consume. The surplus was exported or was destroyed. Some experts expect this luxury has now come to an end. Europe 's mountains of butter have been depleted, its grain silos emptied and its lakes of milk drained. "The era of overproduction is behind us," says Stephane Delodder, an agricultural specialist with Rabobank in the Dutch city of Utrecht . While new agricultural lands are being added in Russia and South America , more and more land is lost to residential and industrial development in Asia and Europe . In China , eight million hectares (20 million acres) of land under cultivation have vanished within a decade. For comparison, just under 12 million hectares (30 million acres) of land are currently used for agriculture in Germany . These spatial limitations would be tolerable if the world's population wasn't growing at such a breathtaking pace. 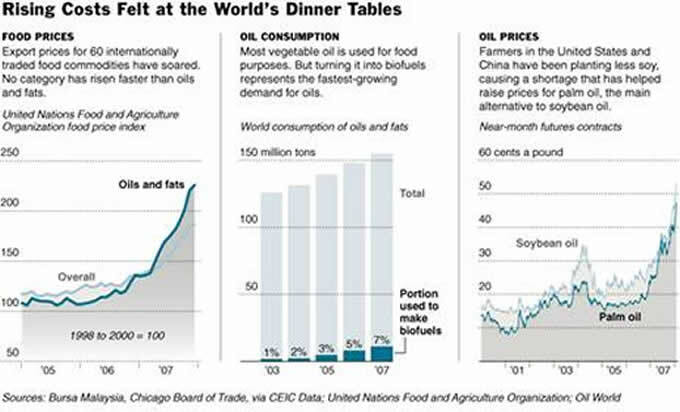 The world faces a serious food crunch "that is not getting nearly enough attention from global leaders" the head of the world's biggest fertilizer producer warned last month. Global grain reserves are "precarious" at only 1.7 months of consumption according to Bill Doyle, CEO of PotashCorp. Profiting from world agricultural demand, he noted "we believe that in many ways we are just getting started and the best is yet to come." As hundreds of millions more people in China , India and elsewhere attain higher-protein diets, Doyle expects global production of grains and soybeans will fall further behind demand. 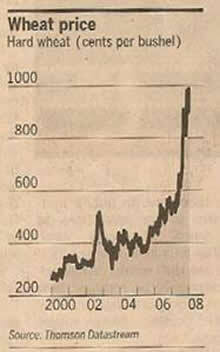 From 1961 to 1970, the price of crude oil was static at about $1.80 per barrel. Based on the quality of wheat produced in Saskatchewan during that 10-year period, average price received by farmers was $1.58 a bushel. La Nina conditions now pose a significant risk to U.S. corn production in 2008, says Iowa State University meteorologist Elwynn Taylor. By late December those La Nina conditions had met specific guidelines that point to the possibility of drought in 2008. Throughout history people have eaten more meat and protein as they have become richer. This is called the nutrition transition and it's now happening, very quickly, in the two most populous nations on the planet – India and China . Although we are coming off a record corn harvest, if elevated price levels do not subside the impact would be staggering according to some experts. For example, current grain prices imply that land rents in Iowa and the rest of the Corn Belt should increase by a factor of about 2.8. A simple calculation points out biofuel's less-than-stellar potential. To fill the roughly 100-liter (26-gallon) tank of an SUV, an ethanol producer has to process about a quarter of a ton of wheat. Charles Munger and Warren Buffett both note that a good business environment – one where a company can earn reasonable margins and expand – is one of the main elements that has been present in their best investments. We think the agricultural and energy sectors present the best business environment investors will find. In the end these long term positive trends will serve our investors well. remember the starving children in China? 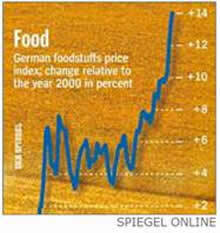 Are we going to be engaged in discussions or is there any inclination to reverse the trend of food shortages? Like demolishing concrete structures if need be and plant crops? Or are we going to be after bottom lines which translated into reality mean only worthless paper if resources are not available? We in Europe should have kept those surpluses, destroying them what a ridiculous move!